Here’s a tasty treat for your little ghoul’s lunchbox. Place a hot dog on a cutting board. 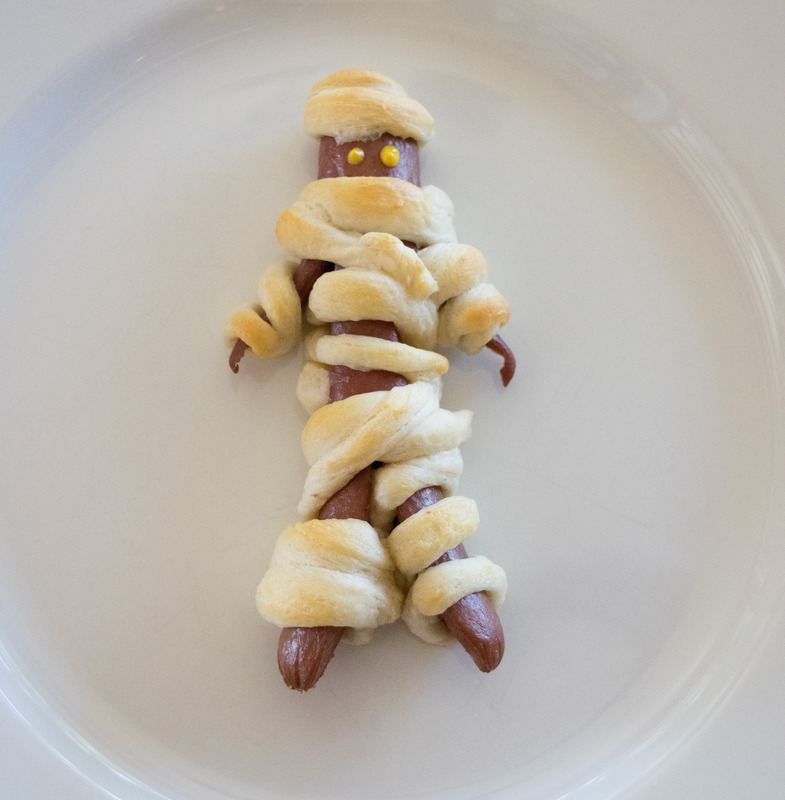 Make the mummy legs by slicing the bottom third of the the hot dog in half, lengthwise. Leave the top inch of the hot dog intact. This will be the head. Starting right under the head and about 1/4 inch inch in, make a slice on each side for the arms, angling out and ending up right about where the legs start. Boil the hot dogs 1-2 min until the arms and legs curl out. Let them cool. 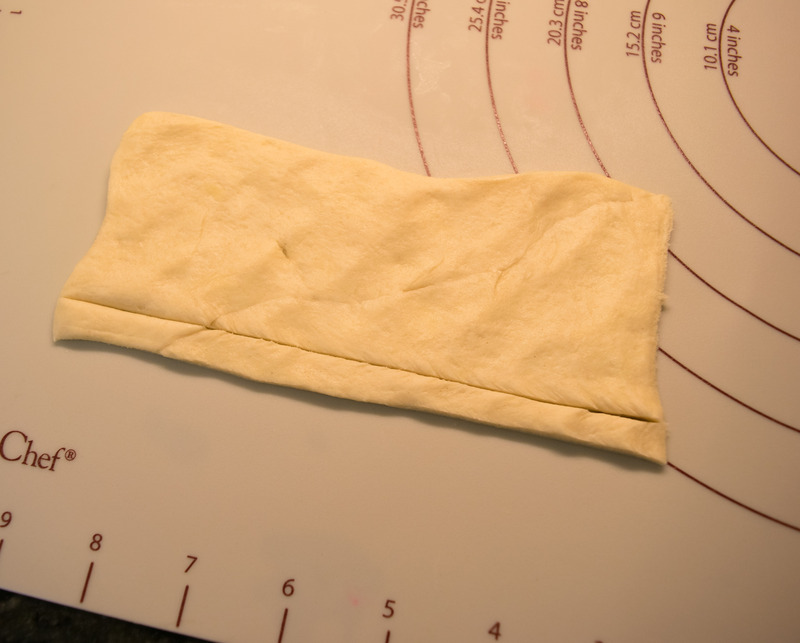 Unroll the dough. 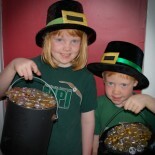 Ours came in 8 triangles. We kept two triangles together to make 4 rectangles of dough. Wrap the strips of dough around each arm and leg, the body, and the top of the head. Follow the manufacturers’ directions to bake the mummy, but reduce the time by several minutes. You want the dough cooked but not necessarily browned so that it looks like a white mummy. Our dough called for a 12-14 minute bake time and we baked them for 10 minutes. Use dots of mustard for the eyes and serve with blood (ketchup) and guts (relish). Too much slicing? Make baby mummies. Cut each hot dog in half, cross-wise. but do not slice the arms and legs. Use bits of rolled dough on the top 1/2 inch of the hot dog, leave some hot dog exposed for the face, then wrap the rest of the hot dog in rolled dough. Bake as directed above and add eyes. With projects like these, I often make one from start to finish to see what it looks like at the end. That way I can tweak it and improve upon the rest. 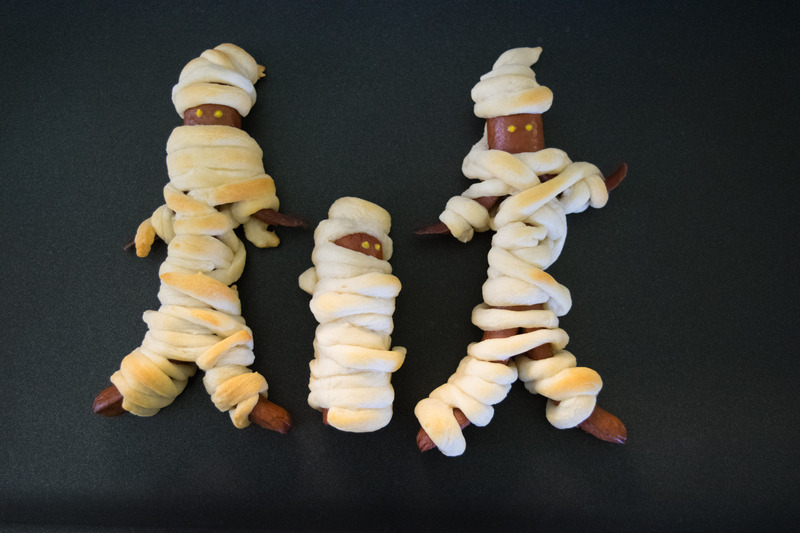 This entry was posted on October 11, 2015 by mdaucello in Halloween, Holidays, Recipes and tagged crescent rolls, Halloween, hot dogs, lunch, mummies, mummy, snakc, treat.